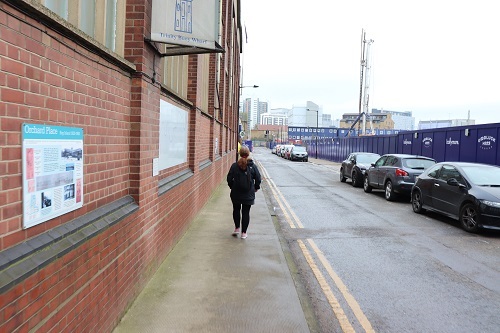 Isle of Dogs Life « This site is a celebration of life past and present on this small part of London’s East End. 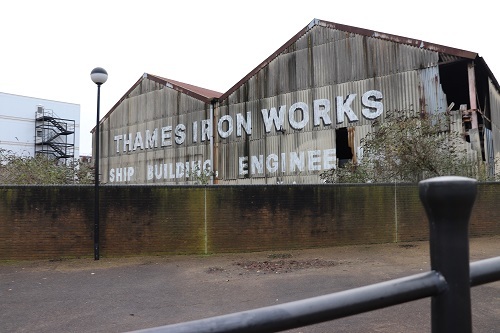 With the weather getting warmer, it has been time to visit some of the more interesting locations on the Isle of Dogs. 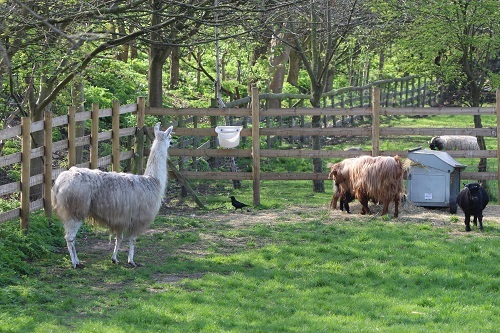 Spring is a great time to visit Mudchute Farm and Park or to wander along the river walks. 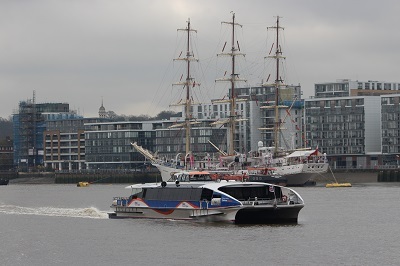 It is also a great time to wander around Millwall Dock not only to look at the birds in the dock but also to watch the many people enjoying the watersports at the Docklands Sailing and Watersports Centre. The centre is located at the far west end of the dock where the dock previously connected to the Thames. 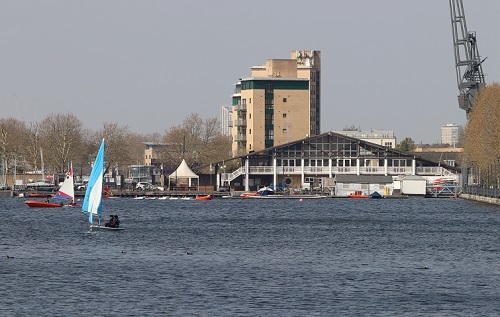 The Docklands Sailing and Watersports Centre was set up in the late 1980s by the London Docklands Development Corporation and the Sports Council carrying on the work of a number of water based community initiatives that had been operating since the 1970s , the award winning centre was designed by Kit Allsopp. 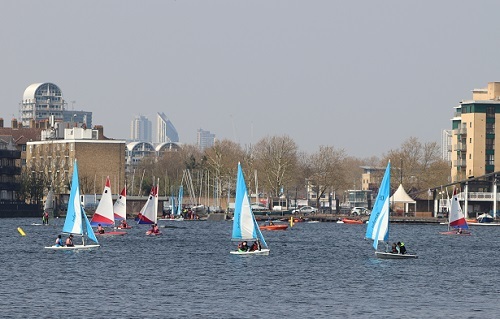 The centre is now run as a charity by The Docklands Sailing & Watersports Centre Trust. 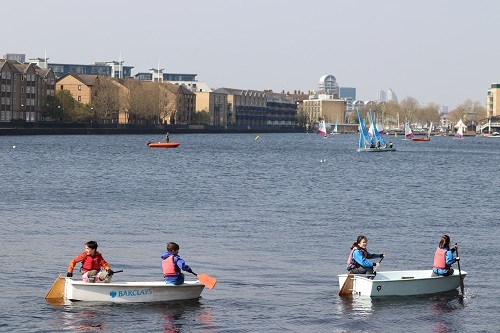 With so many great community schemes on the Island, the Docklands Sailing and Watersports Centre is sometimes overlooked, which is a shame because they have been committed to providing affordable watersports for all for many years. 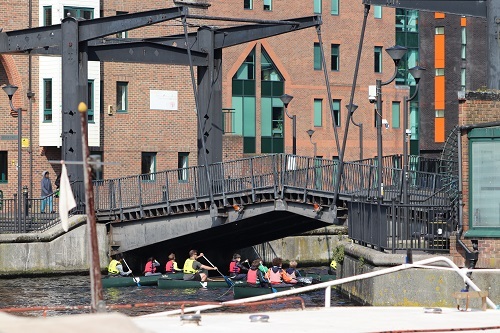 It is worth remembering that young people and adults enjoying water sports in an inner-city environment was virtually unknown when the centre started. Every year, over 6,000 children, school groups, families and people in the community use centre to sail, kayak, canoe and windsurf. 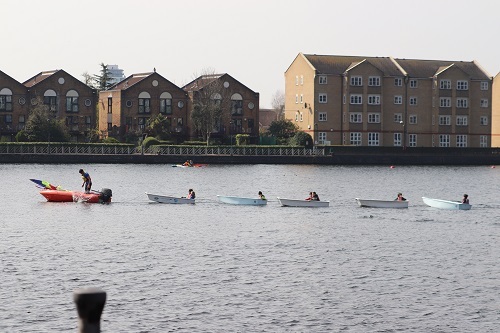 Quite often in Millwall Dock, you can sit and watch the various activities and see the great enjoyment that learning watersports can give to adults and children. 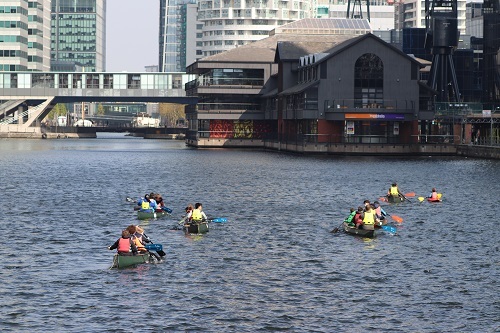 The centre has courses for adults where you practise your skills of learn new ones, the centre is known for training competitive dragon boat teams. For the younger generation, there is Dinghy Sailing, Kayaking, Canoeing and Windsurfing. During the school breaks especially the dock is full of children enjoying themselves and it is a very colourful scene with the different sails bobbing about on the water. It is one of the less understood parts of the Island that although there are plenty of large developments catering for single people, for those who are raising a family on the Island there is a wonderful range of places for a family day out. 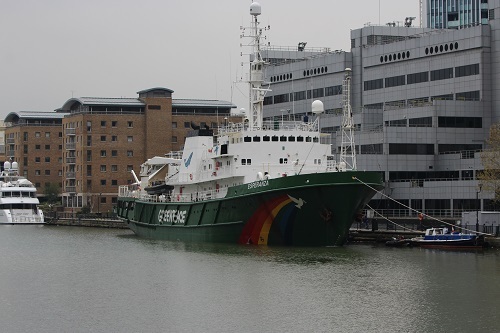 After my own cruise around Britain, it is some suprise to see the MV Esperanza ship operated by Greenpeace in West India Dock. The ship was originally a fire-fighter ship owned by the Soviet Navy, built in 1984 in Poland. 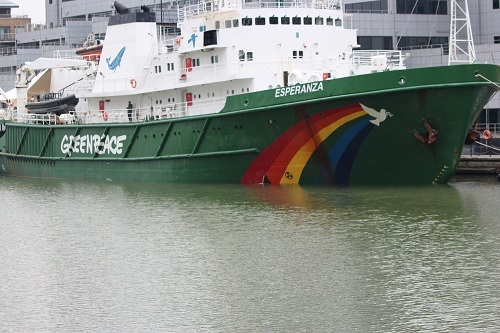 It was recommissioned in 2000 and launched in 2002 after being named Esperanza (‘hope’ in Spanish) by visitors to the Greenpeace website. 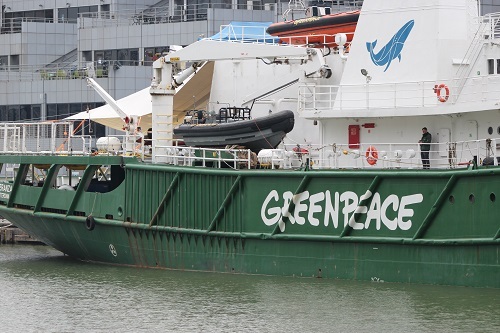 The ship has undergone a major refit by Greenpeace to make it more environmentally friendly and has a helicopter deck and boat cranes. The ship is considered a heavy ice class which means it can be used in polar regions. The ship is quite high tech with live webcams and state-of-the-art underwater monitoring equipment, including a remotely operated vehicle (ROV) which can shoot video down to a depth of 300 m, and a camera capable of reaching depths of 1,000 m.
It has already been involved in many campaigns, but is in London to launch one of Greenpeace’s biggest ever expeditions – an almost year-long pole to pole voyage from the Arctic to the Antarctic – to highlight the many threats facing the oceans and to campaign for a Global Ocean Treaty covering all seas outside of national waters. 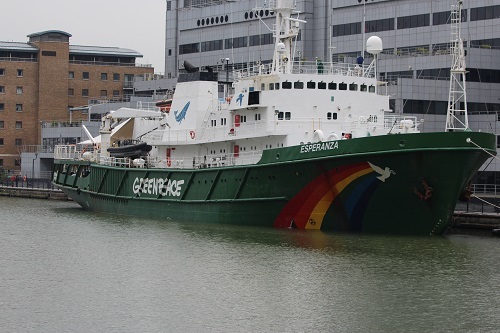 The Esperanza is in London this week ahead of the expedition and has been the focus of a number of events which features a multidisciplinary team of climate scientists and marine biologists. 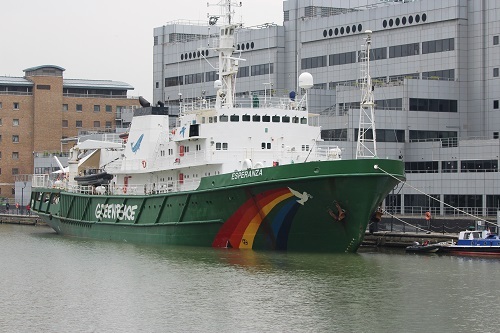 The Esperanza is not the first Greenpeace ship to visit West India Dock, MV Arctic Sunrise visited in 2013 before being taken over by Russian authorities during an oil campaign. 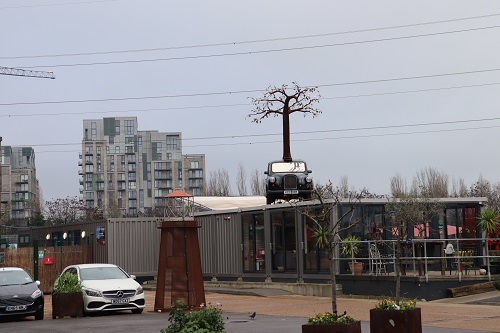 Nobody can fail to be aware of the major developments in Canary Wharf and the Isle of Dogs but a recent visit to Trinity Buoy Wharf suggests that change is even coming to one of the more isolated parts of the area. Orchard Place has been transformed by the City Island development and gradually the building works are moving near to Trinity Buoy Wharf with the Goodluck Hope development which will provide 804 new homes, commercial units, an education space, and a restored Grade II-listed Orchard Dry Dock. The impression of isolation that has been a major characteristic of Trinity Buoy Wharf for centuries is gradually disappearing as lorries trundle up Orchard Place. Keen to pay homage to its history, the name of some of the old firms are now displayed in the buildings and information boards give an interesting history lesson. 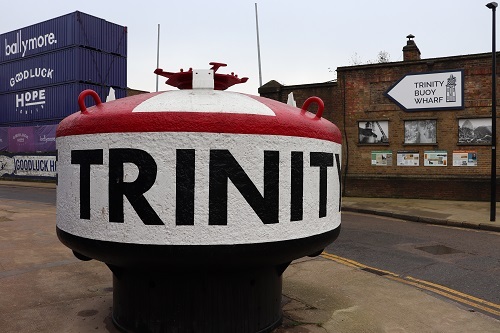 The area has a fascinating history, For nearly two centuries the Corporation of Trinity House occupied this site from 1803 to 1988, but even before then in 1760s Trinity House were storing buoys in nearby Blackwall. The site was mainly used for storing buoys and other marine equipment but gradually workshops were added for testing, repairing and making equipment. The Lighthouse was not built to aid the Thames river traffic but was an Experimental Lighthouse which was designed by James Douglass, the one still standing was not the first one however there was another experimental lantern nearby built in the 1850s in which the famous scientist Michael Faraday carried out tests in electric lighting for lighthouses. 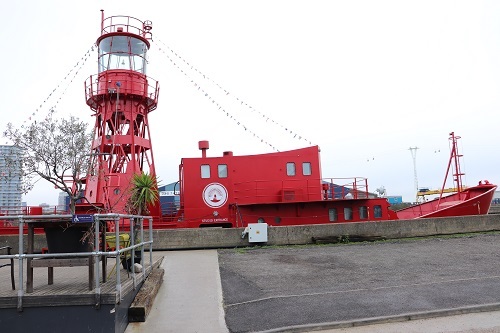 The present lighthouse was constructed in 1864 and was used to experiment with electric light and different coloured lights the results being checked at Charlton across the river. After the second world war the lighthouse was used for the training of Lighthouse keepers. 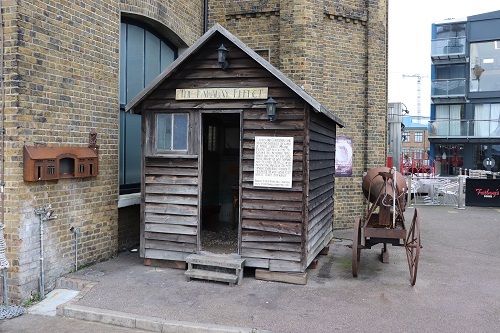 Outside the warehouse in memory of the work of Michael Faraday is a small shed called the Faraday Effect. Lined up against the jetty is an old Trinity lighthouse ship which has been turned into a Music Recording Studio. 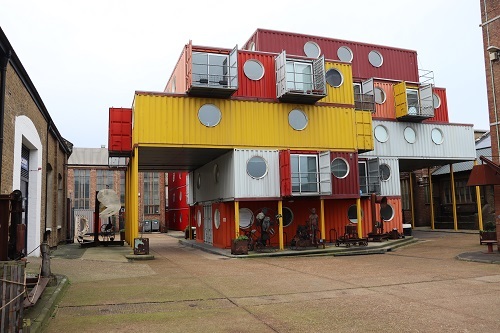 Old shipping containers have been painted and made into office blocks called Container City . 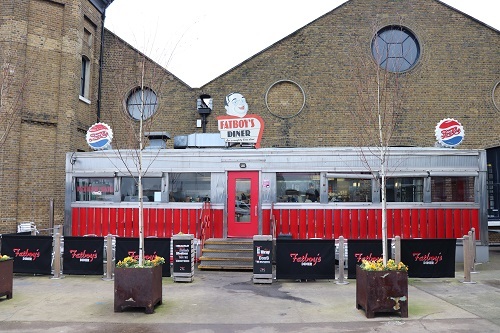 Fatboy’s Diner, a genuine 1940s American Diner from New Jersey has now been moved in front of the lighthouse. 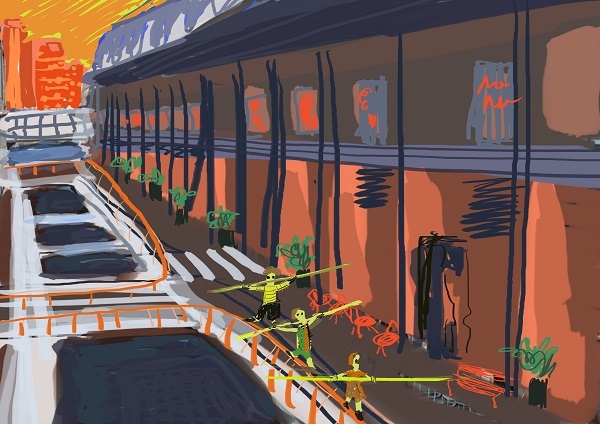 For the last twenty years, Trinity Buoy Wharf has been developed into an Arts Quarter and a film by Rupert Murray here tells the story of how the location is now a workplace to over 500 people who often work in the creative industries. There are new proposals that includes the development of new buildings to provide additional floorspace, a new riverside walkway and public square. 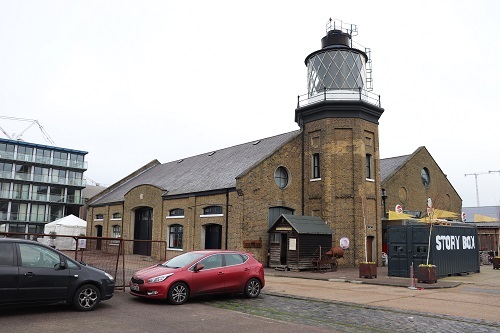 As usual, I will try to keep up with new developments and chart some of the changes that will transform Trinity Buoy Wharf in the next few years. It is that time of the year when the spring flowers are blooming, the blossom is filling the trees and the birdsong is at its loudest. Although I enjoy the urban life, I do yearn occasionally for a walk through a woodland and the sound and smell of rural life. To get my rural fix, I do not have to travel to far because we have Mudchute Park and Farm on our doorstep. 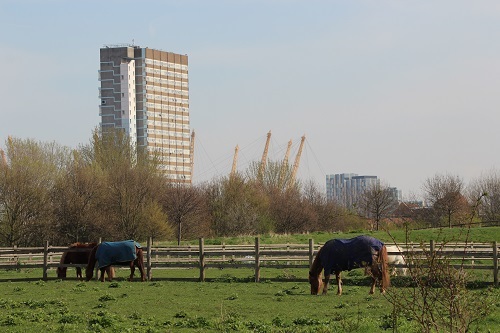 Like most things on the Isle of Dogs, Mudchute Park and Farm has a fascinating history, the large open space where the Mudchute Farm and Park now stands was for centuries grazing land. However during the building of the Millwall Docks in 1865 much of this land was used for storing the bricks that were used to build the dock walls and buildings. During construction of the Millwall Docks in 1865–7 the land remained a brickfield, However after the docks opened in 1868 the land was once again used for grazing. This changed in 1875 when The Dock company developed an innovative system of dredging its docks designed by the company’s engineer, Frederic E. Duckham. This involved the pneumatic transmission of mud, out of the dock into a pipe which ran under East Ferry Road to be deposited on the grazing land creating a mudfield. Over time the mud accumulated to create small hills and bumps, however towards the end of the 19th Century there was concerns when the mudfield was considered a health hazard and steps were taken to close the pipe which was discontinued in 1910. 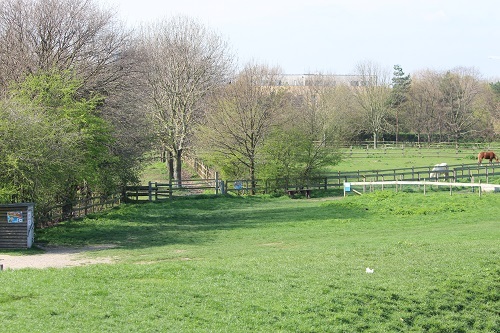 Gradually the hardened mudfield became known as the Mudchute and was later used for allotments . At the beginning of the war the land was used for gun placements. 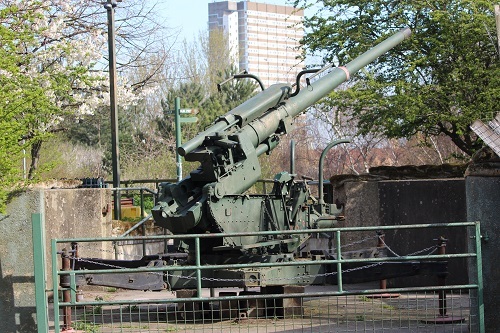 Many people may be surprised when they come across a large Ack Ack Gun in the farm but this is a reminder of its former use. 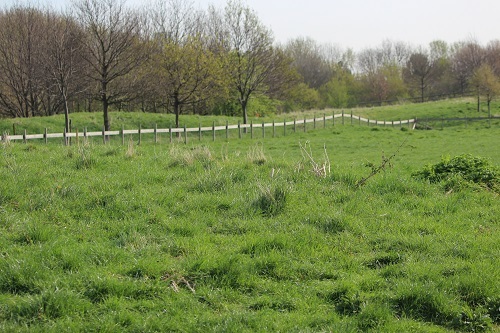 After the war various schemes were put forward for the use of the land , however it was not until 1973 that the site was transferred to the GLC to be used for housing. However there then began a campaign by local residents and supporters called the Association of Island Communities who wished the land to be used as public open space, the success of this campaign led to the creation of an urban farm in 1977. 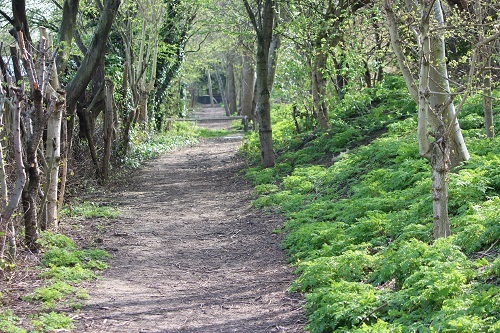 In 1977, the Mudchute Association was formed to preserve and develop the area which they have done by adding to the existing fauna and flora to provide a diverse environment that attracts all forms of wild life. It was somewhat ironic that the mud that had caused dismay to many people was full of nutrients that provided good growing conditions for many plants. 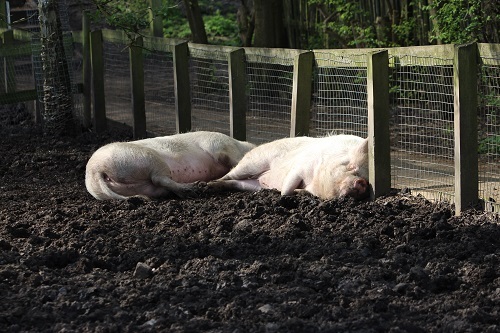 Farm animals have been introduced over the years to give visitors a variety of experience, there has always been an educational aspect to the Associations work and close ties have been developed with local companies, local schools and other community groups. Spring is a wonderful time to visit the farm with spring lambs running around the field. The outer parts of the park is woodland with lots of wildlife and paths that take you all over the park. The sheep were not the only attractions, there Alpaca were enjoying the sunshine as were the various horses, cows, donkeys, chickens, turkey, pigs and much more. 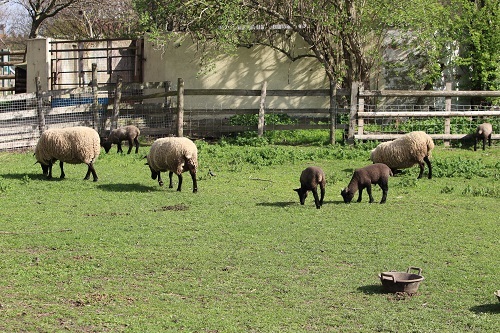 Mudchute Park & Farm is one of the largest inner City Farms in Europe with a wonderful collection of British rare breeds and currently home to over 100 animals and fowl. Set in 32 acres of countryside in the heart of East London, Mudchute is a community charity which runs a number of events throughout the year. 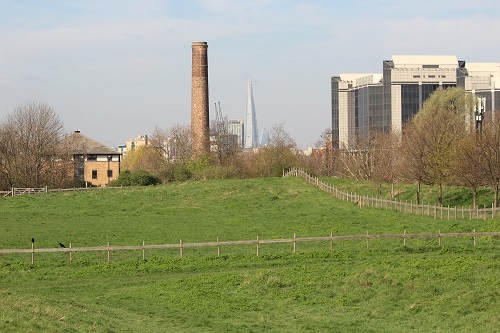 If you suffer from some the strains of urban life, why not take a wander to Mudchute and enjoy the wonderful rural surroundings of the park and farm. 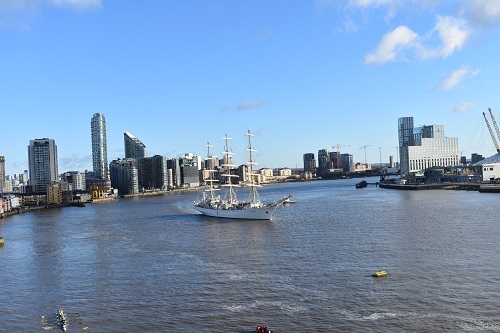 Those taking a walk this morning near the river would have been treated to the sight of a tall ship gliding down the Thames. 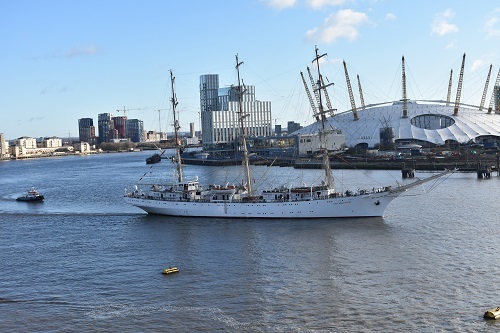 The Dar Mlodziezy is a Polish sail training ship which was launched in 1981 at the Gdańsk shipyard in Poland. She had been built to replace the frigate Dar Pormoza which had been used to train officers for over fifty years. The Dar Mlodziezy was one of six similiar ships that were were built by the same shipyard. Her sister ships were named Mir, Druzhba, Pallada, Khersones and Nadezhda. Her home port is Gdynia and she has been owned by the Gdynia Maritime Academy since she was built in 1982. 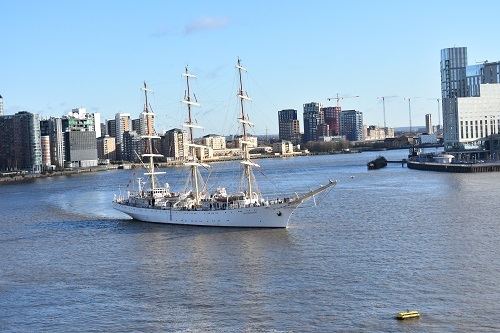 The Dar Mlodziezy was the first Polish-built, ocean-going sailing vessel to circumnavigate the globe in 1987–88 and been a regular in Tall Ships’ Races for over 25 years. 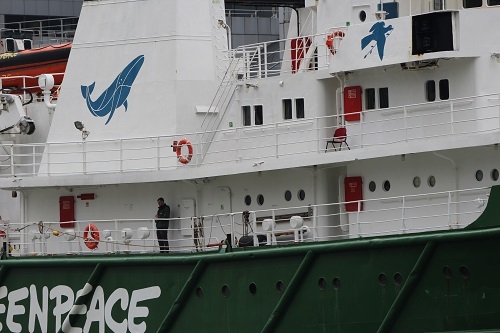 The ship is 108.8 m (357 ft) long with a beam of 12 m (39 ft). She usually sails with a crew of around 176 (40 crew and 136 cadets). 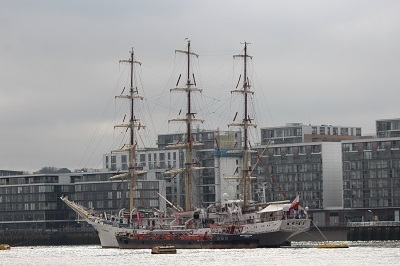 If you would like a look at the ship, she is currently berthed at Greenwich. Many thanks to Eric Pemberton for the photographs . 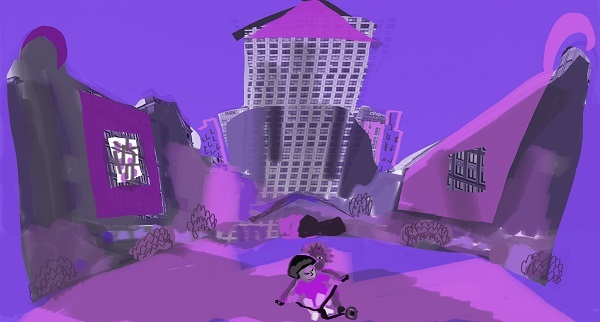 Recently I published an article about Love on the Isle of Dogs, the latest work by writer, illustrator and broadcaster Jude Cowan Montague. 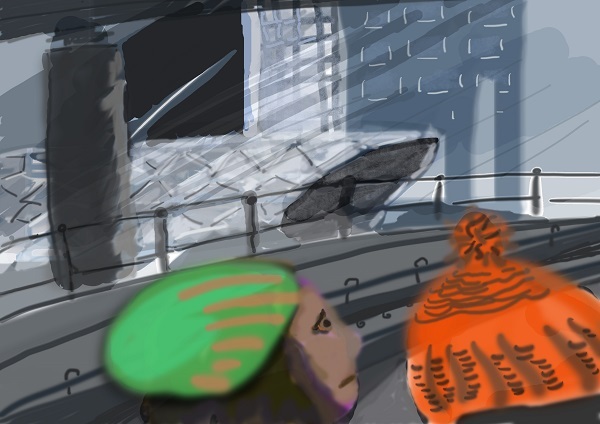 I am delighted to say that Jude has produced a series of drawings that show Canary Wharf in a very different light. 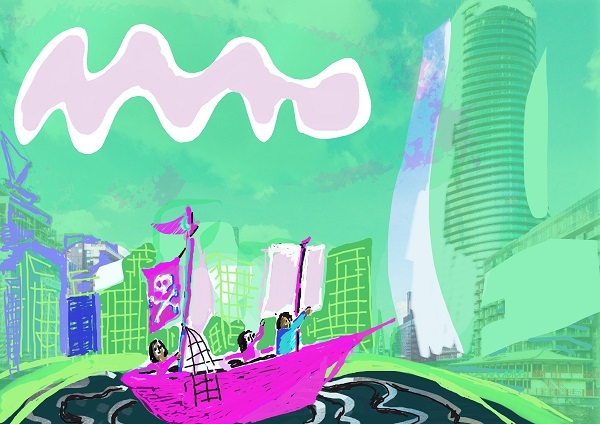 Canary Wharf may be the workplace for thousands of workers but there is no reason that children can turn it into something very different. My daughter was born on the Isle of Dogs, in one of the self-builds on the Westferry Road. When she was young I would carry her to Mudchute Farm to see the animals. In the 1990s, Canary Wharf was not yet the glassy, chrome wonderland it’s become. But I can imagine it as a strange kind of paradise for young eyes. There is the fairground ride of the DLR, the circuses, the huge towering, impossibly high mountains of buildings, so clean and crisp. It is a city that doesn’t obey ordinary suburban rules. And the docks, these wide expanses of water have a little magic of lakes, so deep, so close to the buildings. A touch of the Lake District here in London. 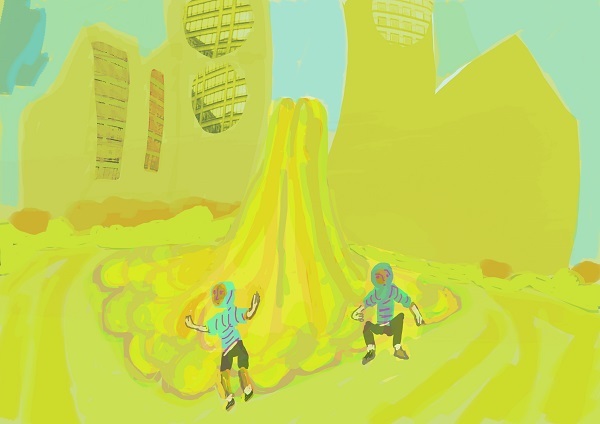 ​Canary Wharf, with its dramatic scale, could re-engage with our inner child’s perception. It can be a tool to look at the modern world as a kind of unrealistic dream. There is a unrealism to the brassy image of shiny commerce. In these pictures I have used its dynamic environment as a trigger of wonder. As part of International Women’s Week, the Friends of Island History Trust will host an exhibition which will be looking at the significant contribution of women living, volunteering and working on the Isle of Dogs from the 20th Century onwards. The exhibition includes a screening of a short film entitled Island Girl, by the female students of George Green School and an exhibition of images of ‘Island Women’ by Designer Anna Lincoln and will include a presentation by FoIHT on the life of Nellie Cressall, one time Island resident and former Mayor and Councillor for Poplar. During the afternoon attendees will also be invited to reflect on and consider how the Equality Act and recent campaigns have impacted on ordinary women today and how further changes can be achieved. 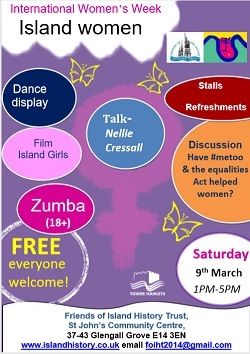 The afternoon will start off with a fitness session in the main hall with Zumba for ladies 18 and over from 1.15 until 2.15, at the same time the presentation on the remarkable Nellie Cressall will take place in the history room.